Often times, big software updates steal the show, but our team of developers is constantly working on improving the CRM. The small update digest will keep you abreast of smaller changes and updates that we've made to the CRM. We've been working on more than just the new calendar! Read on to learn the small feature tweaks and updates we've added in the past few weeks. Before, you could only see company activity on a company record via our mobile site; we did not display the activity of contacts who worked at the company, like we did on the full version of LACRM’s site. On the full version of LACRM, you can view contact and company activity under the company’s activity feed. This allows you to view your full history with a company and everyone who works there from the company’s record in LACRM. 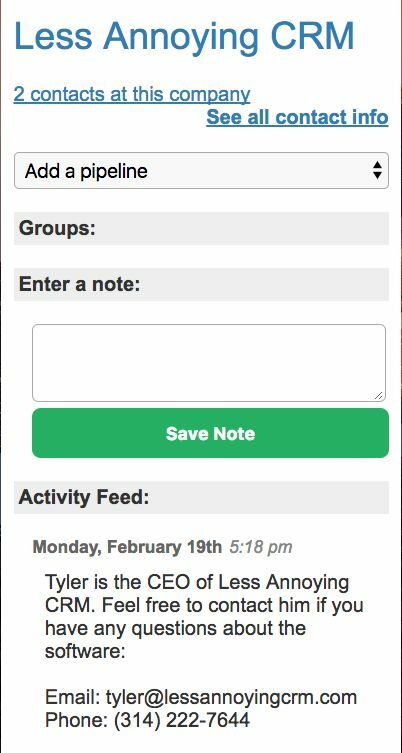 Now, on our mobile site, your company activity feeds will display contact and company activity, unless you have unchecked the “Include activity from contacts at this company” box on a specific record on the full version of the site. Before, we could not support emojis in task names (if you tried to add one, it would not save the name of the task properly). Now, when creating a task, feel free to stick an emoji in the name! Our development team is working on adding emoji support to more aspects of the site. Hold your mouse over stuff — you’ll notice some new pieces of information! A contact attached to a task: if you hold your mouse over the name of a contact attached to a task from the Workspace, you’ll see the contact’s full name. This can be helpful if the name is very long and the CRM is cutting characters to save space. An event or task in month view in the new calendar: this is a part of our new calendar feature! If you hold your mouse over an event or task in the month view, you’ll see a breakdown of the date/time, attached contacts, as well as attending users. Thanks for checking out our most recent updates, and stay tuned for more! Have questions? Use our contact page to get a hold of us, and we'll be happy to help however we can.